Is your bed so comfortable that you never want to get out of it? The only thing better than sleeping in is having someone serve your breakfast in bed so that you don’t have to leave it. If you’ve ever had breakfast in bed, you know just how wonderful it is. Why not do that for someone else? Whether the occasion is Valentine’s Day, Mother’s Day, a birthday or anniversary, or just because, the gesture is sure to be appreciated. Not big on cooking? No matter. Here are a few simple recipes that anyone can make… and everyone is sure to enjoy. Combine the ingredients in a blender, or use an immersion blender to blend them. Be sure to use frozen strawberries to get a thicker, colder smoothie, and the jam to make the strawberry flavor extra intense. Put a tablespoon of oil or butter in a frying pan over medium heat. Use a heart-shaped cookie cutter to cut a heart out of the center of the bread. When the frying pan is hot, put the bread with the heart-shaped hole in the oil or butter, and crack an egg into the hole. Let the bread and egg fry until the egg is solid enough to turn, and then flip it with the spatula. Cook for an additional 30 seconds, and then transfer the bread and egg to a plate. Ideally, the egg whites should be cooked all the way through, but the yolk should still be slightly runny. Bonus: Add a little more butter or oil to the pan and fry up the heart-shaped piece of bread that you cut out with the cookie cutter. 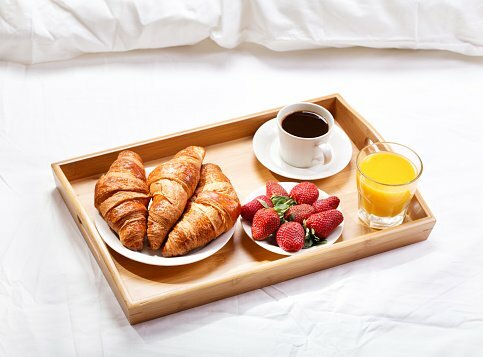 Now your breakfast in bed is ready to be served! Parfaits are easy to make. Just take turns layering the yogurt, granola, and fruit in a sundae glass for a pretty effect. Top with a few extra berries for garnish. Cover a cookie sheet in parchment paper or wax paper. Dip each strawberry in the vanilla yogurt and lay it on the cookie sheet. Put the cookie sheet in the freezer for at least three hours, although you can also make these the night before and leave them in the freezer overnight. Any of these breakfasts would make someone’s morning very special, particularly if they don’t have to get out of bed to enjoy it. Don’t have a bed comfortable enough to make breakfast in bed sound appealing? It might be time to upgrade your mattress. Check out MATTRESS360 in Northwest Phoenix, and get a heavenly new bed to go along with that to-die-for breakfast!